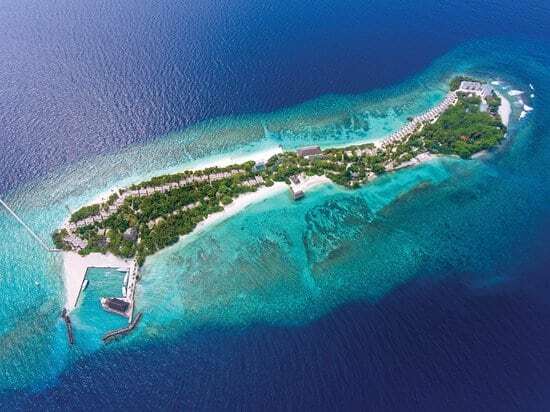 Set on a secluded island featuring the Exotic House Reef, this contemporary all-inclusive resort is accessible by speedboat from Male International Airport. Vibrant villas feature furnished balconies or patios, open-air bathrooms and flat-screen TVs; upgraded villas are set on the beach. The 2-bedroom beachfront suites add living areas and private pools. There are also villas on stilts offering private plunge pools and overwater decks. All food and drink is included at the buffet restaurant and bar next to the outdoor pool, as are 2 excursions per stay and use of pedalos, kayaks and paddleboards. There’s also an upscale spa and a diving school.